An undoubted testament to winter fortitude, the Concord Chamber Music Society attracted a full-house crowd on Sunday at the Concord Academy for a serving of hearty Germanic chamber music, with a Russian twist. Indeed, Concord, Massachusetts, as a small arts-enclave, impressed with a line-up of exemplary classical performers of the highest caliber, the majority of which drawn from the Boston Symphony Orchestra. The afternoon showcased guest-violinist Axel Strauss, whose presence and musicality added an authentic German flavor to chamber music favorites. Beginning with a rich, tenderness in Mozart’s Duo No. 2 in B-flat Major for Violin and Viola, K. 424, Axel Strauss and Cathy Basrak, viola, gave a delicate, accurate, and honest rendition of what could otherwise have been soulful and operatic (with noted runs of articulate sautillé by Basrak). To follow the Mozartian morceau, Wendy Putnam, Steven Ansell, and Mihail Jojatu (violin, viola, and cello, respectively) convened on the stage for Beethoven’s robust and dramatic String Trio No. 4 in c minor, Op. 9, No.3. The idiomatic contrasts between the two classical-era composers allowed for extra-nuance — whatever the Mozart had been lacking in explicit drama, the Beethoven made up for in sheer drive. Minute questions of intonation aside, the trio packed a punch in terms of dynamic contrast and spirit (Allegro con spirito being an odd marking for a first movement in the brooding key of c minor), with obliggati in the violin, voice-passing in the three string parts, and sense of flow given maximum interpretive attention. The first-half came to an exotic, if not modernistic conclusion in Schnittke’s Moz-Art (on K.416d) for two violins. Introduced by Wendy Putnam, and then concluded by Axel Strauss, the violinists explained the idiosyncrasies of the piece, its fragmentary basis from a Commedia dell’Arte sketch Mozart left unfinished, as well as a hint at Strauss’s scordaturi “twists,” which definitely assisted in his transformation into a viola. Indeed, this performance felt the most enlivened and fresh – perhaps the modernistic idiom allowed the performers to attach more emotional, albeit playful, involvement. Schnittke’s artistry, his imitation of older idioms through a modernistic lens, certainly came through in this duo woven together by manifold fragments, even a hint to Mozart’s Symphony No. 40, and a scordatura trill executed, with the wiggle-of-a-thumb, by Strauss to round it out in what could only be described as a somewhat polite “classical” courtly bow. Five musicians assembled for the rich, polyphonic, rhythmic churning closer, Brahms’s String Quintet No. 2 in G Major, Op. 111. Heroic and flowing, the first movement announced itself as a windswept landscape, with a wonderfully played, rich cello solo from Mihail Jojatu. Scintillating oscillations in the violins were balanced by the soulful expressivity of middle-aged Brahms, transfigured by hearty bratsche-voice playing and musicality by Steven Ansell and Cathy Basrak. The second movement, Adagio, reached near, but not beyond subtle melancholy in the viola solo — as if at a distance from some kind of unspoken tragedy. The third movement, serving as a kind of intermezzo, likewise seemed at a distance from the passionate disposition at the core of the movement. The fourth movement left scorched earth in its wake. Marked Vivace ma non troppo presto, the movement seemed to arrive at full-throttled gypsy energy in anticipation of a satisfying conclusion, bringing the audience, and the piece, to a sudden, if not earnest arrival. Given the wintry trials of the first week of 2018, the Concord Chamber Players and Axel Strauss delivered true warmth. 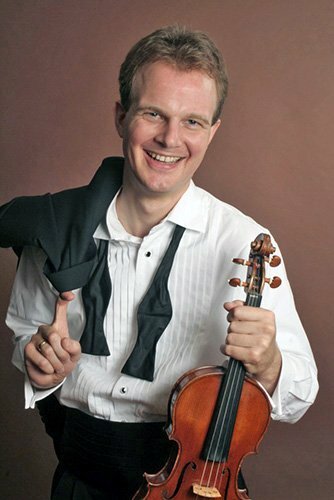 Nicolas Sterner, cellist, conductor, organizer, commentator, musical facilitator, and Santa Barbara native, has performed with the Boston Philharmonic Youth Orchestra, and has organized and participated in a range of local productions as both cellist and assistant conductor.